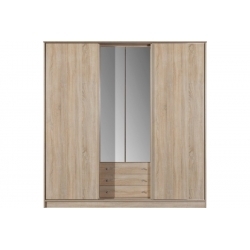 Meblar Wardrobes are a combination of exceptional quality and aesthetic values. This furniture is made of good quality materials that is laminated boards in the color of natural wood (dark or light), white, black or multicolored. Choose between classic wardrobes and furniture with additional drawers or lockers, ideal for storing laundry, towels or bed sheets. The range of Meblar includes traditional wardrobes and with sliding doors. Apartment without wardrobe? It's impossible! Strade Furniture wardrobes are furniture of various size, functions and design. Due to this you can easily find a closet that perfectly fits your needs! One-door wardrobes - small size but surprise with their capacity; a good solution for a youth room or one-room apartment. Two- and three-door wardrobes - usually a combination of two cameras with a hanger and in combination with drawers and shelves, are ideal for a bedroom. Large sliding door wardrobes - extremely functional and capacious, they are suitable for storing both personal and outer clothing. They can also be used as a wardrobe. Corner cabinets - this solution is designed for rooms where there is no place to insert a traditional wardrobe, allows you to equip the corner of the room. Cabinets with mezzanines - mezzanine in the form of additional cabinets and shelves - ideal solution in rooms where there is no storage space. Youth cabinets - are characterized by the presence of colored inserts, bring cheerfulness and good energy to the children's or youth room.